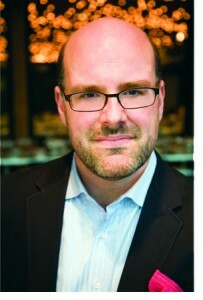 You can meet Mitchell Davis at the James Beard Foundation Dinner on August 12th at the Kahala Hotel & Resort. Mitchell Davis, Executive Vice President of the James Beard Foundation had so much to say to our questions, that there simply wasn’t room to run them all in the magazine. His complete interview is below. What first sparked your interest in the food industry? I was always interested in food, from the time I started eating. As a toddler I used to make concoctions in restaurants with the condiments on the table. I was always fascinated with the kitchen and started cooking early in the morning when I was 8 or 9 years old, before anyone else was awake. I used to pretend I was sick in elementary school so I could stay home and watch cooking shows, which were only on during the day in those days. At 11 I was given a copy of Julia Child and Company by my sisters for a Hannukah gift, and by the time I was 12 I had cooked almost all of the menus in the book. I started working part time in a butcher shop in 10th grade, Wednesday afternoons and all day Sunday. And halfway through the year, I started to make chicken soup that was sold in quart jars the shop. You achieved a doctorate in Food Studies. What is that and how it is applied? Food Studies is a broad area of academia that touches any discipline for which food helps illuminate our understanding in some way. It’s a form of cultural studies that includes sociology, anthropology, history, environmental studies, economics, you name it. It’s difficult to define because it can mean so many things. My research focused on media and the impact that restaurant reviews have on taste on a macro cultural level. But others in my program at NYU are looking at farming, national cuisine, culinary education, food systems, you name it. I’ve read you always wanted to be a chef. How did you go from working with food to writing about food… and which one do you enjoy more? My favorite thing in the world to do is cook, and so anything that takes me into the kitchen is always welcome. Part of what I like about cooking is feeding people delicious things. So to the extent that writing about food can help people eat delicious things, either by giving them a good recipe or directing them to a great restaurant, the two go hand in hand and I like both of them. You’ve authored 4 cookbooks. How do you decide what recipes to feature and are they all your own? My recipes are a combination of my own and of things that others have taught me. A few of my books feature chef recipes. In fact my latest is an e-book with Michelin three-star chef Laurent Gras, which I co-wrote. They are his recipes from growing up and working in Provence. But I helped shape them and test them so that the end result is really a collaboration. (You can download the book online at www.altaeditions.com). It’s very hard to create a recipe that no one has ever cooked before. But cooks bring their own personalities to the food they make. The problem with writing a cookbook is it forces you to set down a recipe in stone, or at least on paper. And my favorite way to cook is to open the fridge and see what’s there and what I can think of to make with it. That’s the creative part. So writing a recipe is more like a snapshot for me, rather than a set of rules. It’s what I did at that moment, not necessarily what I always do. I try to make new things all the time so the number of recipes is endless, really. I also think that people need to learn that you can “play” a recipe the way you play a musical score, interpreting as you go along. I encourage experimentation even in baking, which many people think is more doctrinaire. I disagree. You’re in town for a Julia Child tribute. I read somewhere you attempted to cook through her cookbook as a child? What influence has she had on your life and did you ever meet her? Although my professional career in food has revolved around James Beard, it was Julia Child who really shaped the cook I became. I was obsessed with her cooking shows and books almost my whole life. I just loved the way she cooked and the food she made, which was both approachable and sophisticated. I can’t explain why. But I know the episodes and menus of many of her shows like they were my own. I can recall the menus in that book I got when I was 11, “Dinner for the Boss,” “A Buffet for 17.” I was fortunate to meet her a few times. In college I was invited by a friend to one of the many 80th birthday parties that were thrown for her around the country (the one I went to was in LA). And then she was sometimes involved in our work at the Beard Foundation. She and Beard were great friends for many years and she was always supportive of our work. We honored her at one of our annual events, Chefs & Champagne in the Hamptons, and she sat for hours on a barrel and signed books and chatted with an endless line of adoring fans. I was among them. Please describe your food philosophy. I think good food begins with good ingredients that are carefully prepared, whether you are making something as simple as a hamburger or as complicated as the finest restaurant entree. And to me, the most important things at the end are taste and balance. I say it all the time, but it takes no more effort to make something taste good as it does to make it taste bad. So I think there are no excuses for bad food, whatever your interest or skill or income. Maybe there is an excuse for bad taste, but even then, our tastes change and I think we can and should develop our tastes the same way we develop our ear for music or our eye for art. You joined the James Beard Foundation in 1993. What were you first hired to do there and how has your job evolved during your tenure there? I was hired as director of publications by the organization’s founder, Peter Kump, a former student and friend of Beard’s, and I was responsible for our monthly newsletter, which mostly consisted of information about our upcoming events. As the Foundation and interest in food and chefs grew, so did our publications and communications. We added a quarterly magazine and then when the Internet appeared on the scene we added all sorts of different ways to communicate with members and people generally interested in food. Somewhere along the road, good food became less a pursuit of affluent people seeking status and more a general interest of people interested in artisanship and craft. Then as chefs gained in popularity, and issues about our food and food system sparked much broader interest, we expanded our role again. Now I am responsible for an annual conference of food thought leaders and other programs to help chefs have a voice in the important issues about food in our Society. Chefs are household names. Food carts have gone gourmet. The quality of food you can find across the country has really improved tremendously. James Beard and Peter Kump would have been so proud of how quickly the American food landscape has changed. We are now a model for parts of the world that are losing their traditions. Working for the epitome of culinary excellence I can only imagine you’ve had some of the most exquisite dining experiences ever. Does one in particular stand above the rest? Impossible to say. I eat very well. But I will say the best meal is almost never where you expect it. Expectations are so important when it comes to satisfaction. Sometimes, with all the media hype, we set impossible goals for our eating experiences. Great ingredients, simple food, good friends, a nice glass of wine, a lazy evening or afternoon, these are the ingredients for a great food experience. It can happen anywhere. What is the furthest you have traveled on a food quest and what was it for? I once flew to Paris for lunch. It was the opening of Alain Ducasse in Paris and I was there for a day to experience the magic courtesy of Air France. Funnily enough, the chef de cuisine at that time was Laurent Gras, who has since become a great friend. He is the chef I just wrote the ebook with. But I didn’t know him at that time. I’ve driven 7 hours for a meal, and then driven 7 hours back. I’ve slept on the floor on a piece of cardboard so I could afford a meal at a three-star restaurant the next day. There isn’t much I won’t do for a great meal. Not even, just a great loaf of bread is enough to make me travel far and wide. I just like to cook, period. Favorite (and or least favorite) food trend? I love the trend of sophisticated food in casual environments. I also love that chefs are really cooking again. I love a good salad and nice piece of grilled fish, but that’s something I can do at home. I shop at the same farmers markets that chefs do. When I go out, even if it’s just a weeknight meal, I want to see chefs cooking things that I can’t because of their skill and dedication and staff and equipment. I hate that a lot of the best new restaurants don’t take reservations and so you have to wait for a long time to sit down. I guess those are really restaurant trends, but that’s what came to mind first. I’m not always a fan of chefs doing everything themselves. I believe that bread baking and charcuterie making and other forms of food preparation are their own crafts. That’s not to say sometimes it isn’t great. But just because something is homemade or housemade doesn’t make it better unless it is. I think everyone should do what he or she does best. Have you been to the Islands before? What’s on your must do list while here? I was in Hawaii in 1992 at the start of the Hawaiian Regional Cuisine movement. I’m curious to see where it has gone in 20 years. I also want a bowl of traditional saimin. And I intend to find my favorite malasadas. Is there any other information about yourself that you want to share with our readers? I just want people to realize that the quest for good food isn’t a frivolous pursuit. I agree with people like James Beard and Julia Child who believed that all food should be good, well raised, carefully prepared, no matter how much money you had or where you lived or where you were eating. And I think that the more people cook and become comfortable with food, even talking about it, the better our food will be.